Just like most everyone else in North America, I'm more than ready for SPRING to arrive! It's taken me a few months, but I've finally set up my craft and sewing space and ready to get back into crafting and sewing. This week at House Mouse and Friends Monday Challenge blog the card theme is SPRING, using a House Mouse (Happy Hopper or Gruffies) image. This wee mousie snuggled under the spring violet sings spring to me. It really felt good and was fun to get my fingers inky, to color and try to remember 'how do I make cards?' It is true that if you don't use it, you lose it! So I look forward to joining in more challenges as time permits. Let's all keep positive thoughts that this last little blast of winter we are having will be the last and that spring is finally on its way. I love that little mouse sleeping under the violets! It really looks like Spring! Love the colors on your card! 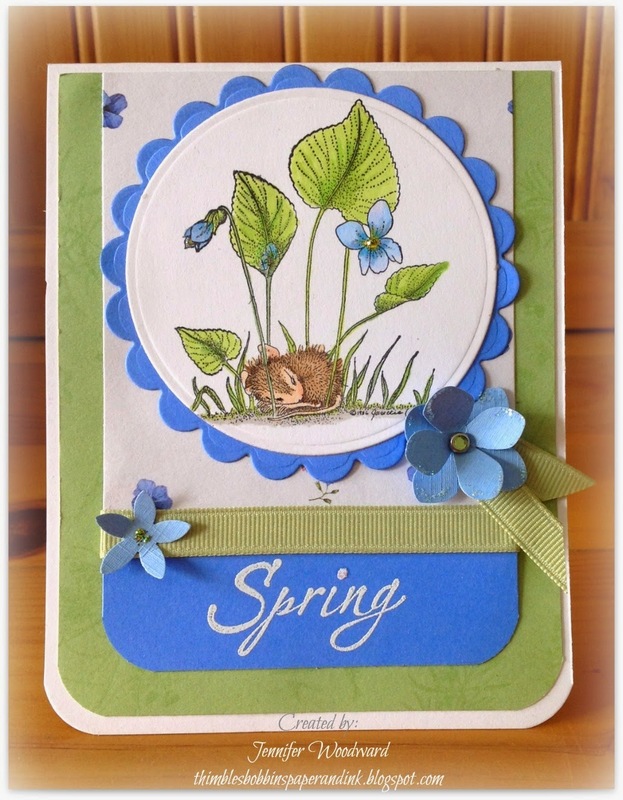 Hi Jen, so good to see you making a House Mouse card again!!!! You still got it girlfriend, this card is adorable. Colored up beautifully. Congrats on having your room all set up, this is so sweet, lovely coloring! Ohhhhh...I love House Mouse stamps and this one is so adorable. Your colors are wonderful. Great card. You bet I'm ready for Spring...this card just brought a tease of Spring air with it!! How Spring like and beautiful it is!! Wonderfully done Jennifer!! Thank you for sharing with us at House Mouse and Friends...good luck!! Absolutely adorable! Thanks for joining us at House Mouse and Friends Monday Challenge.